Clinton Childs scores from long range on Nebraska's first play vs. Arizona State in 1995. Q: What was it like playing behind the Pipeline? CC: It was a bond between us, such a big trust there with everyone knowing their job and getting things done. We were told in the huddle that we had to run a certain play and we had the confidence that the big guys up front could get it done. You had Brenden Stai, Zach Wiegert, Rob Zatechka and those guys, all those guys. We knew that everyone knew what their assignment was and we had total faith in those guys getting their job done. Q: Who recruited you out of high school? CC: It was Dave Gillespie, who was the Recruiting Coordinator at the time. And Dan Young was responsible for recruiting Omaha. It was a fun time, just having different coaches from different colleges actually coming down to visit the home, speaking with my mother, speaking with my grandmother. My grandmother was a die-hard Tom Osborne fan. I think if it weren’t for my mom and my grandmother being able to watch me play, maybe I would have ventured out and played football elsewhere. It was the impression Coach Osborne had made on my grandmother that made it comfortable for me to go down there and that she’d be able to see me play. And one way I’ve always described Tom Osborne to everyone? His demeanor is exactly what you see on TV, is exactly what you get in person. You get so many different people who can turn on the switch and they’re completely different people from talking to them in person compared to television, they can put on a front, but he was exactly the same all the time. Guys were pretty much gonna tell you what you wanted to hear in the recruiting area, too: “You can come in next year and be our starting running back.” That’s just one of the things they use as a recruiting tool, and I looked at the big picture. A cousin of mine had me looking, and I almost went to Kansas. He had me looking at it in a way. 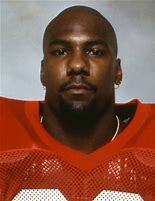 Tony Sands was a running back and they started to turn the corner to get good, and he was on his way out and I knew that I hadn’t passed my ACT and that I was probably going to be a Prop 48 so I would have to sit my freshman year (which was his senior year), so I probably could have stepped in and been the starter right away, as soon as that one year was over. Q: Well, I’m glad you came to Lincoln, Clinton. CC: (laughs) I’ve heard that before. CC: Well, if you want to talk about it from a religious standpoint, Ron Brown was really good at not pressing the issue on you as far as religion goes, but his thing was, “If there is a god that you believe in, make sure you worship that god and be true to yourself and be true to the god that you believe in.” Ron Brown, as we all know, is a very, very strong Christian man. I respect him for that. Religion is a huge thing for me and my family, and it always has been. Turner Gill had a major impact on a lot of things, as one of the younger coaches, and he related to a lot of the young men -coming from Texas- and showed them the ropes. I developed a real good relationship with Turner. Another great guy. Q: You know, I used to have lunch with Turner and Ron. It was one of the best half hours you could spend at the training table. Upstanding gentlemen, right? CC: Well, I’m a firm believer in the way they lived their lives. Look at Turner Gill now, all the work he’s put in. And a lot of people say it’s unfortunate he didn’t get the head job down in Lincoln, but I’m a firm believer that God has a plan for everyone. I’m really happy for Turner and his accomplishments. It’s about how being loyal to people and being true to yourself can take you a long way. Q: Clinton, what was your last game? CC: The Fiesta Bowl versus Florida. Q: That’s a heck of a way to go out. CC: Oh, yeah. Heck, yeah! My last game for Nebraska. I played in the ’96 Hula Bowl that year over in Hawaii, too. It just goes to show you what Frank Solich did with his running backs, you know? 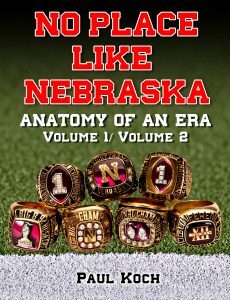 Q: Anything special stand out to you as to why Nebraska was so dominant in that time? CC: Trusting and believing in each other. It all goes back to the factor of how the offensive line did their job, and it was the same way on the other side of the ball with Charlie McBride. The type of fire he brought to those guys, he was a mastermind defensive coordinator. Everyone believed in it. It was a very, very, very bad taste in our mouth against Florida State, when we got robbed against Florida State. From the time that we came back from that game, what was it 18-16 or something like that? We had that score in Memorial Stadium every day we worked out. 1:16 on the clock, which was a huge reminder of how close we were to getting that done, and there was no way we were ever going to fail. Q: What about that game stands out to you? CC: I think as a whole, as an entire team, we believed we were the real national champions that year. We had these t-shirts made up which said, “Unity-Belief-Respect”, and we had those t-shirts and we knew that there was no way we were going to leave it in the hands of referees or whomever to finalize our statement for that next year. We just knew that we were all going to come together, and we came together and everyone had the same goal and everyone worked together. We didn’t hardly have guys gone out of town over the course of that summer. Everyone stayed in Lincoln so we could get that job done. Q: A player in your position, looking back, what would you say you sacrificed to play at that level? CC: Well, it was always a dream of mine that I had, I actually wanted to wrestle in the 1996 Olympic Games. And like I said, I was being recruited. The guy who’s now the head coach of the U.S. Olympic team, Zeke Jones, was recruiting me to come and wrestle at Bloomberg College out there. I pretty much had to make a choice, because I was a two time All-American in football, a blue chip, and I was actually ranked #8 in the country in wrestling my senior year. I didn’t even go wrestle in the national tournament then. I wrestled as a sophomore in the largest national tournament there is, I placed my sophomore year and my junior year. So I was a three-time high school All-American at wrestling. Still to this day, I think I’m the only 2 sport All-American that Omaha North ever had. Q: Wow, that’s pretty impressive. CC: Like I said, that’s my first love. I remember sitting at the high school national wrestling tournament, remember sitting there with Tolly Thompson. We were good friends. Q: You know, I was the wrestling strength coach. I always thought Tolly would have made a decent defensive end. CC: Tolly was a heck of an athlete, man. He was actually pretty damn good at football in high school, as well. He was from Cedar Falls, Iowa. CC: Yeah, and it’s great to see Trev at Omaha now. I hope to get over there someday to sit down and talk to him and see how he’s doing.